Who says chicken coops only have to look like, well, a chicken coop? If you’re planning on raising chooks but want to keep your backyard looking beautiful with them in it, then here’s one chicken coop design you just might like! This fairytale chicken coop was designed by the owner-builders themselves. It provides both a shaded and an ‘open’ chicken run, complete with other features their chickens need to stay healthy and safe! You can rebuild this chicken coop for your yard, but remember that when choosing a coop design for your chickens it is important to do enough research first. You have to consider space requirements, chicken behaviour and their needs. 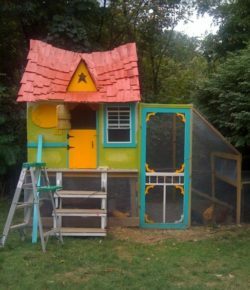 If you think that this exact build is not suitable for you then you can instead use it as inspiration to design your very own fairytale chicken coop! Why have a plain and boring chicken coop, when you can have this fairytale-like structure in your backyard? Next PostLearn how to build a rocking chair crib!